Well known as the clown of companion birds, Caiques are loved by bird fanciers for their outgoing nature and ability to make people laugh with their playful antics. The proper way to pronounce caique is “kai-eke”-don’t ask for a “cake” at the bird shop. They might point you to the nearest bakery! If the African grey parrot is the intellectual of the bird community, and the macaw is the show-off, then the caique is the clown. Caiques have been called clowns more often than Barnum and Bailey have had shows in three rings. There is a good reason-the clown is a truly appropriate metaphor for this medium-sized mischief maker. 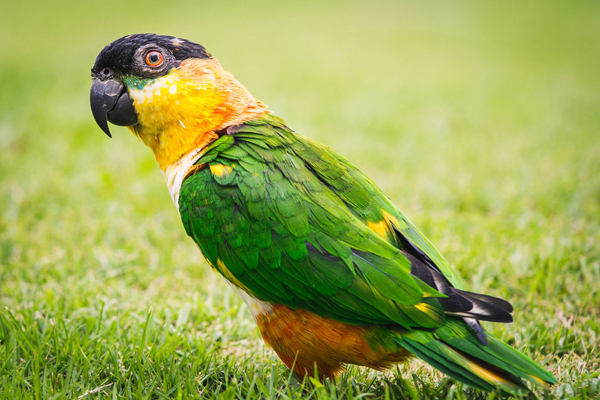 Two species of caiques are commonly kept as pets: the black-headed caique (Pionites melanocephala) and the white-bellied caique (Pionites leucogaster). 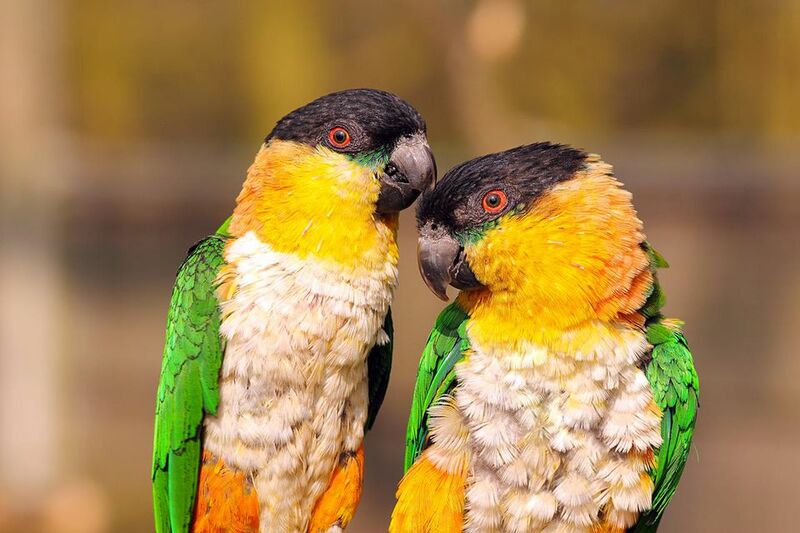 The yellow-thighed caique, a subspecies of the white-bellied, is also kept as a pet, though it is less common in the pet trade. The black-headed and the white-bellied caique have a similar appearance, with a few obvious distinctions. They both are about 9 to 10 inches long, and their color composition is relatively simple, with “sections” of the bird in green, orange, yellow, and white. 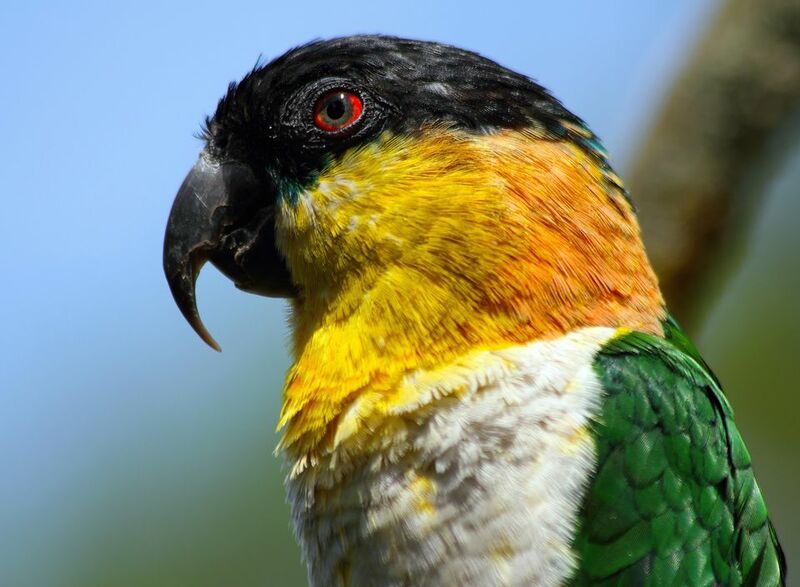 The black-headed caique has, obviously, a black head and black beak. While the white-bellied has, you guessed it, a white belly (so does the black-headed, incidentally), horn-colored beak, and a bright orange and yellow head. The caique is a stocky bird, surprisingly heavy for its size, as most new owners will point out. Though the caique is a medium-sized bird, it needs a large environment. This energetic bird will suffer greatly from being confined to a small cage. Think about building a small aviary if you can. At least provide your caique with the largest housing you can afford. Make sure that the bar-spacing is appropriate for a bird of its size and that there’s a grating on the bottom of the cage. This playful bird will discover the weaknesses in its cage in no time, so be sure that the cage is of quality construction, such as those made from stainless steel. Aside from the caique’s striking appearance, its personality is the primary reason for its rise in popularity. Caique owners rave about this plucky, active, little comedian. Most bird owners know that they will have to accept the good, the bad, and the “ugly” part of bird ownership when they take on a feathered companion. The caique makes a wonderful pet, but it’s not perfect. They can be stubborn and beaky, and very willful. But they are so cute, it’s difficult to fault them. Keep a very watchful eye on your caique if you have other birds in the house. 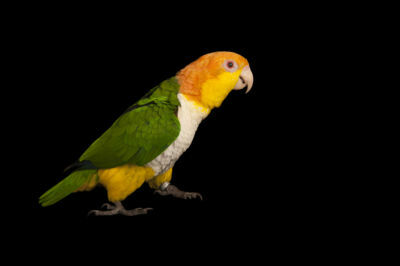 They are known for bird-on-bird aggression, and care should be taken that the caique does not injure another pet bird. Toys are a staple of the caique’s energy-diet. Caiques are always “on the go” and love to play with toys, especially toys that they can demolish. Be sure to have a steady supply of new toys on hand to replace the old ones when they become ragged or are disassembled. You’ll have to experiment with several types of toys to find your caique’s favorites. Fortunately, there are many types of toys on the market to choose from. Make sure that they are safe before you give them to your caique.